China has the most diverse and breathtaking geography in the world. It has the highest altitude and temperature differences of any country, mighty rivers, huge deserts, grasslands, karst zones, cities, and conurbations. These 10 most impressive things about China&apos;s geography should interest travelers. 1. China has the greatest altitude difference on Earth. 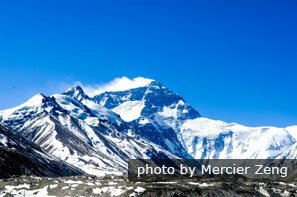 Mount Everest, world&apos;s highest peak at 8,848 m, is shared between China and Nepal. Tranquil Ayding Lake in the Turpan Depression at 154 meters below sea level, is the third lowest area on dry land after the Jordan Rift Valley and Djibouti&apos;s Lake Assal. This gives the largest altitude difference of any country on Earth: 9,002 m.
The Yarlung Tsangpo Canyon in Tibet is the deepest and second-longest canyon in the world. It stretches an endless 500 km (300 miles) between Himalayan summits, and exceeds 5,800 m (19,000 feet) at its deepest point. Zhangjiajie Grand Canyon is much smaller, but it has the world&apos;s highest and longest glass bridge that runs across the canyon for 430 horrifying meters, over three hundred meters in the air. 2. China&apos;s northeast is frozen in winter. Winter is long, frozen, and snowy in Northeast China. 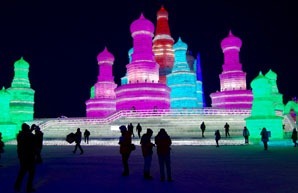 Harbin, also called &apos;Ice City,&apos; freezes for four months a year. The average low in January in Harbin is -25°C (-13°F). At this time, it is a special attraction for tourists interested in beautiful snow sceneries and snow activities. A tourist highlight is the Harbin International Ice and Snow Festival, the biggest ice festival in the world, which attracts 10 to 15 million visitors annually. Huge snow sculptures can exceed 600,000 square meters each. 3. 2 percent of China&apos;s south extends into the tropics. Hainan Island is a tropical paradise. Xishuangbanna, bordering Laos and Myanmar, has tropical rainforest, minority peoples and elephants. 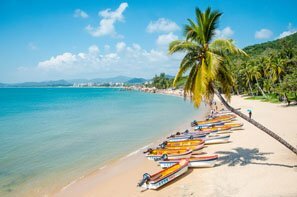 Hong Kong&apos;s beaches are also in the tropics and add to the appeal of this phenomenal destination, with skyscrapers clinging to mountains, and a thriving tourism industry. The areas covered in the last two facts give China the biggest range of temperatures of any nation on earth: below -40 to above 40 °C. 4. The Yangtze is the world&apos;s third longest river. See the best of the Yangtze from the comfort of a cruise ship. The Yangtze is the longest river within a single country and the third longest in the world: 6,300 km (3,915 miles). The source is the highest of any world&apos;s major rivers . The world&apos;s highest railway, the Qinghai-Tibet Railway, passes only 100 km (60 miles) from the Yangtze&apos;s source, at over 5,000 meters (16,000 ft) above sea level. 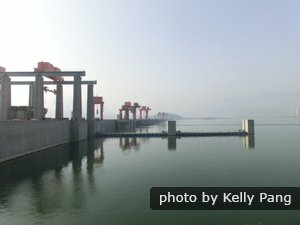 The river also hosts the world&apos;s biggest hydroelectric station and dam: the Three Gorges Dam, which produces a gigantic 22 gigawatts of power. Yet another Yangtze highlight is Tiger Leaping Gorge, another very deep gorge and a hikers&apos; favorite, with mountains towering 4,000 meters (13,000 ft) above it. The Yangtze River Delta conurbation has 88 million people! 5. The Yellow River is cradle of China&apos;s civilization. The Yellow River, second longest river in China, fifth in the world at 5,464 km (3,395 miles), is the deadliest river in the world. It has killed millions with flooding, and holds the record for worst natural disaster in human history (the 1931 Flood killed over a million). 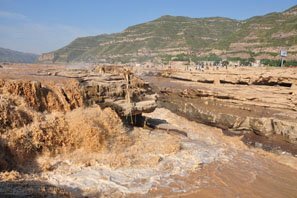 The remarkable yellow chocolate-colored Hukou Waterfall testifies that the Yellow River is also the siltiest river in the world. It consumes 1.6 billion tonnes of silt a year, and has changed its course significantly at least 26 times. It has more cultural significance than the Yangtze, and is seen as China&apos;s "Mother River" and "the cradle of China&apos;s civilization." Prehistoric Chinese lived at the Peking Man site located just north of the Yellow River Basin at Zhoukoudian in the south of Beijing. 6. The Pearl River Delta conurbation is world&apos;s largest urban area. The Pearl River is China&apos;s third longest river at 2,400 kilometres (1,500 miles). The Pearl River Delta (PRD) conurbation has surpassed Tokyo&apos;s to become the world&apos;s largest urban area in size and population according to a 2015 report by the World Bank. It now has more than 120 million people. The PRD, which comprises of comprises the cities of Guangzhou, Shenzhen, Dongguan, Zhongshan, Huizhou, Jiangmen, Foshan, Hong Kong, Zhuhai, and Macau, is about 40,000 square kilometers. 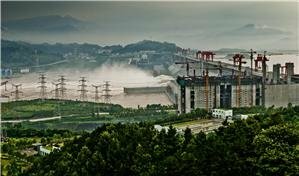 The PRD generated 9.1% (6.8 trillion RMB) of China&apos;s GDP in 2016. Almost 30% of all foreign investment in China was in the Pearl River Delta since 1978. Since 1978, the PRD Economic Zone has been the region with the largest economic growth on Earth, while China has been the fastest growing large economy in the world. The Pearl River Delta makes about 5% of all the world&apos;s goods. Because of these factors, the PRD hosts China&apos;s biggest trade fair, the Canton Fair. 7. China has the world&apos;s third largest desert. The Gobi, the world&apos;s third largest desert, along with the Taklamakan Desert, once separated central Asia from China. 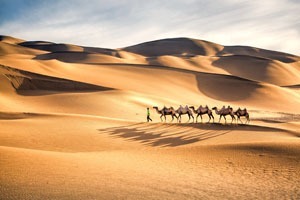 Deserts once divided West from East until the advent of the Silk Road, when these two worlds were connected for the love of trade. Deserts cover nearly a fifth of China, and they have dunes that stretch hundreds of miles. Read more on China&apos;s Top 5 Deserts. 8. 40% of China is covered by natural grasslands. 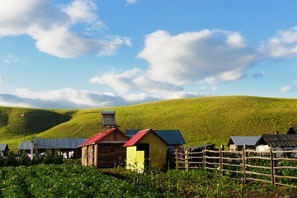 With four million square kilometers of natural grasslands, China&apos;s grassland cover is the second largest in the world. The Hunlunbuir Grassland in the Inner Mongolian region covers about 250,000 square kilometers, the size of the UK. Chinese historians and classic Chinese poets have written verses about it. Read more on China&apos;s Top Grasslands. 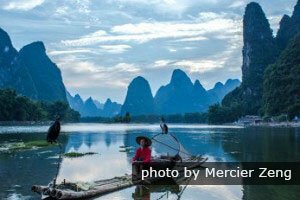 See classic China karst at the Li River. 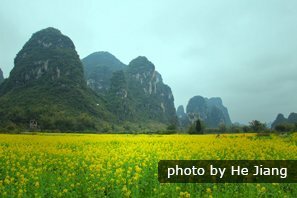 China&apos;s karst covers half a million square kilometers (193,000 square miles). 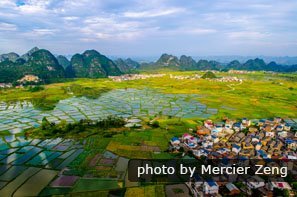 The South China Karst World Heritage site is part of the largest limestone outcrop in the world, and is unparalleled for karst features according to UNESCO. Guilin features the most celebrated karst landscapes and caves, including Reed Flute Cave, the most visited cave in Guilin. The Li River is among National Geographic&apos;s "Top 10 Watery Wonders" with picturesque scenery including pointy limestone hills, bamboo groves, and quaint villages. 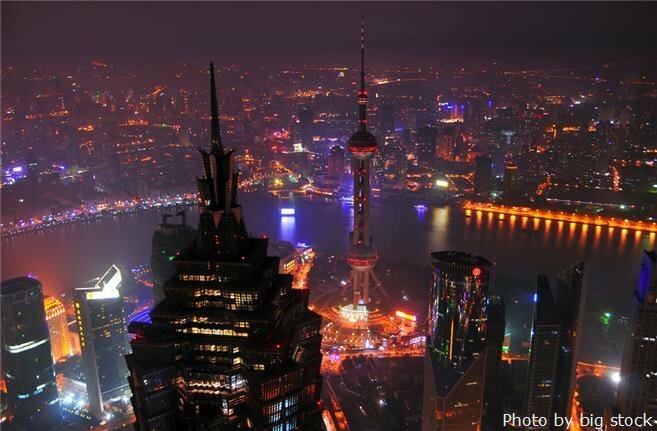 See Shanghai&apos;s towering city center from the second highest building in the world. For those who like the excitement of a city, China has over 100 cities of over 1 million people compared to India and USA that have have just over 50 urban areas (not individual cities) with over one million people each. China has 10 cities with an urban area population of over 10 million, 7 on the east and 3 inland in the Yangtze basin: Wuhan, Chongqing, and Chengdu. 8 of 12 further cities with over 5 million are also on the east coast. China gets less populated the further west one goes. The world&apos;s largest high-speed railway network links most of China&apos;s large cities. China&apos;s cities include 3 out of the biggest 4 in the world for metropolitan population and city proper population. Chongqing is the world&apos;s largest city by city proper population with 30 million, followed by Shanghai with 24 million, while Beijing is fourth with 21½ million. Guangzhou is the world&apos;s biggest city by metropolitan area population with 44 million people, while Shanghai is third with 34½ people and Nanjing is fourth with 34 million. Beijing is seventh. Air quality is a concern in Beijing and other large cities, but China is working to cut down pollution, and air quality is by no means poor all of the time. Leaving the biggest China fact for last: China has the world&apos;s largest population: 1.4 billion — but only about half are in the cities as yet!... And it is urbanizing fastest in the world! Read more on China&apos;s Top 10 Largest Cities. 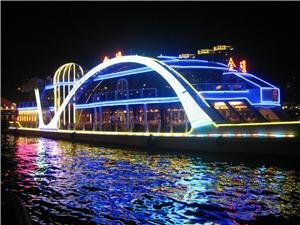 4-Day Pearl River Delta Private Tour: You can enjoy the thriving cities of Guangzhou and Shenzhen, possibly without a visa. 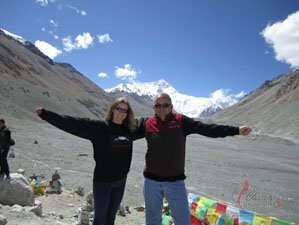 8-Day Lhasa to Everest Base Camp Tour: See Tibet, the Roof of the World, and the world&apos;s highest peak for yourself. 12-Day Silk Road Adventure: Travel back 2,000 years to the days when the silk trade began, and enjoy wonderful sights like grasslands around Heavenly Lake and Dunhuang&apos;s desert oasis. 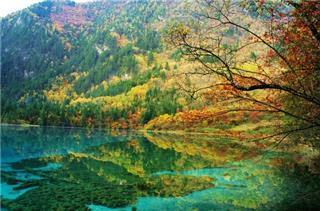 Or have a customized tour: We specialize in tailor-making China tours to suit your interests.